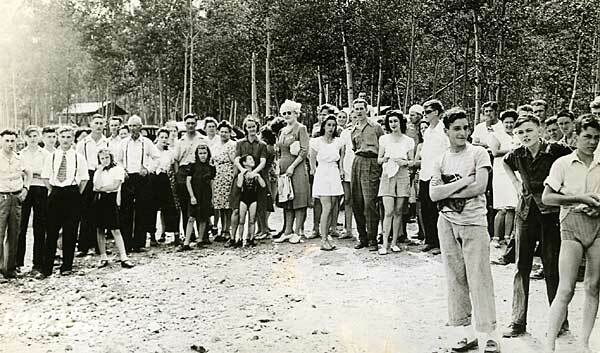 Capreolonline - Capreol: Looking Back - Are you in this photo? Tim Ball writes: I have been going through the boxes of pictures that my dad had left me. I've found a few gems and I thought that I would share them with you and the people of Capreol. Unfortunately, I only recognize one person in these pictures. That would be Armand Sbrega in the Ella Lake 1 picture. In Photo 1 beside the lady identified as Mrs. Reid, my mom thinks that the lady to the left is Aggie McKinley and her daughter Frances Harvey. I think that the 2 dark-haired girls to the right could be the Shannon sisters, Betty (Armstrong) and Joan (Clark). In Photo 2 the lady in the front row, 3rd to the left of Mr. Gibson looks like Mrs. Miles. Hope this helps. My name is Michelle Lalonde (now Piatt). My father was Ken Lalonde (son of Harry and Mary Lalonde..brother to Ivan, Vincent, Denzel, Pat, Ovella, Margie and Gerald). The lady in the picture in the front row with dark hair to the right of the tall man, holding a handkerchief is my mother, Rose Kebicz Lalonde.